This article is a little more technical and is especially useful as a broad overview for first time Food & Beverage entrepreneurs who want to know how to start a restaurant. For overseas investors looking to set up a business in Singapore, this guide will provide highly useful information as well. I’m speaking from the perspective of someone who has first hand experience opening an F&B outlet before, rather than an inexperienced person who just heard how its done from someone. In 10 steps, I will show you how to execute and start a Restaurant or Food and Beverage business in Singapore. Remember, we’re covering the basic setting up of an F&B business, not the operating or running of one, which I can easily write another 100 page article about. 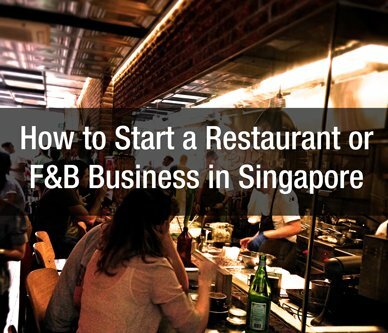 This is pretty basic stuff that every food entrepreneur should be familiar with if you want to enter the F&B industry in Singapore. If you fail to plan, you plan to fail. Always have a business plan even if it’s only 1 or 2 pages long. I would however recommend you to think through each step of the process thoroughly and come up with a more detailed plan. Your business plan should include financial projections, budgeting, marketing strategy, pricing plan, operations, suppliers list, hiring policies, service standards etc just to name a few. Also, it definitely helps to think of your exit strategy and contingency plan for as many unexpected situations as possible. Things go wrong all the time, and you need to be ready. First time owners also tend to under budget, and you don’t want your funds to run out half way before even completing the project. For a successful F&B concept in Singapore, it’s going to take a lot of capital. This is due to high rental rates, high labour cost and just an overall higher cost of living. Depending on the size of your establishment, it will take anything from S$50,000 – S$600,000 or more. You need to figure out where the capital is coming from, as well as leave enough for cash reserves and operating capital. A rough gauge is leaving 3 months of pure overhead expenses as reserves. If you find that you need to scrimp and save to setup an F&B concept, I would recommend not starting one at all. Many times F&B owners cut corners by having inferior renovations/design, underpaying staff, or worst of all, getting a lousy location that has cheap rent thinking you can overcome location with your superior cuisine. Guess what, you might burn off all your cash with losses every month before people even hear about your restaurant. Every single factor counts to the success of an F&B business, and you need to know what you can compromise on, and what is off limits no matter what. You will definitely also want to cater a sum to invest in marketing and PR at the start as well, which is critical for any new restaurant. Lack of awareness is a huge problem from most of the clients I have consulted with, so plan for it well at the start. Time to take your business legit. Just follow the appropriate links I’ve given below and in any doubt, call the appropriate hotlines. If you are a foreigner, you will first need to apply for an Entrepass with the Ministry of Manpower. 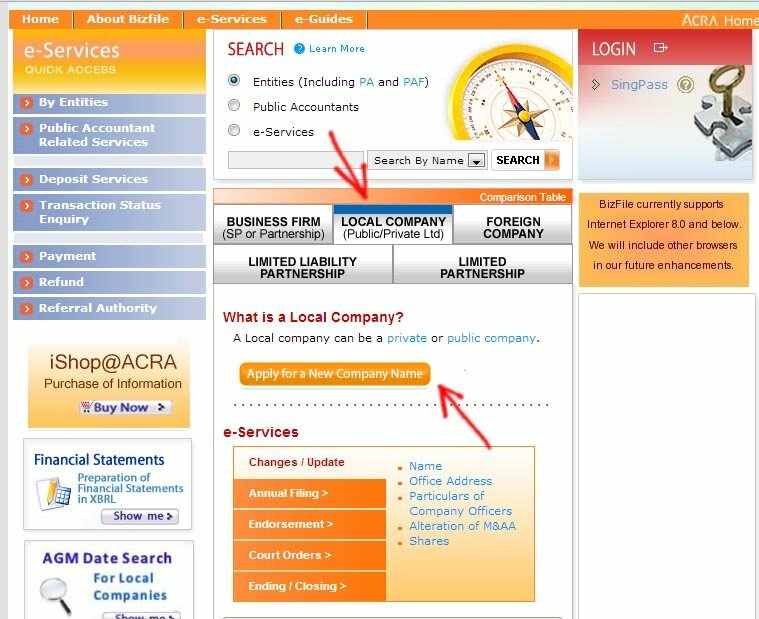 For locals, if you already have a Singpass, the next step is to head to Accounting and Corporate Regulatory Authorities’ Bizfile portal. If not, get your Singpass first. Foreigners will need a Singpass also, after getting your Entrepass. At the Bizfile portal, determine the type of company to register. I would recommend the ‘Local Company (Public/Private Limited)‘ option for limited liability restricted to your business entity only. As the portal is not very intuitive, make sure to click Local Company tab, then click on ‘Apply for a New Company Name’. Go through the steps and make payment (S$15). *For information on the different types of companies, partnerships or sole proprietary, visit ACRA. After your Company name has been approved and payment made, you will then need to pay and incorporate your company with your reserved name under Bizfile again. Registration fees cost S$50-S$600 for locals, or S$300 -S$1200 for foreigners depending on type of company. Personally the bizfile portal isn’t very user-friendly and I hit some road bumps while registering myself. For further clarifications, do give ACRA a call at +65 6248 6028 during Mondays – Fridays : 9.00am – 6.00pm. Personally, I find getting multiple real estate agents to source locations for you to be the easiest and quickest. The down side is that certain locations will require you to pay 1 month’s rent commission to the real estate agent, like for big shopping malls. Most smaller, private landlords will however pay the commission to the real estate agent instead if the deal is done. When using real estate agents, make sure you already know your space size requirement, electrical requirements (M&E), the ideal areas in Singapore you would prefer, and the type of cuisine you are doing so that agents know what to focus on, and what to propose to the landlord. Source for a good interior designer, architect and contractor to create your dream restaurant. The interior designer usually has the contact for contractors he has worked with. A good restaurant design is the first step to creating an impression and attracting new customers into your restaurant. 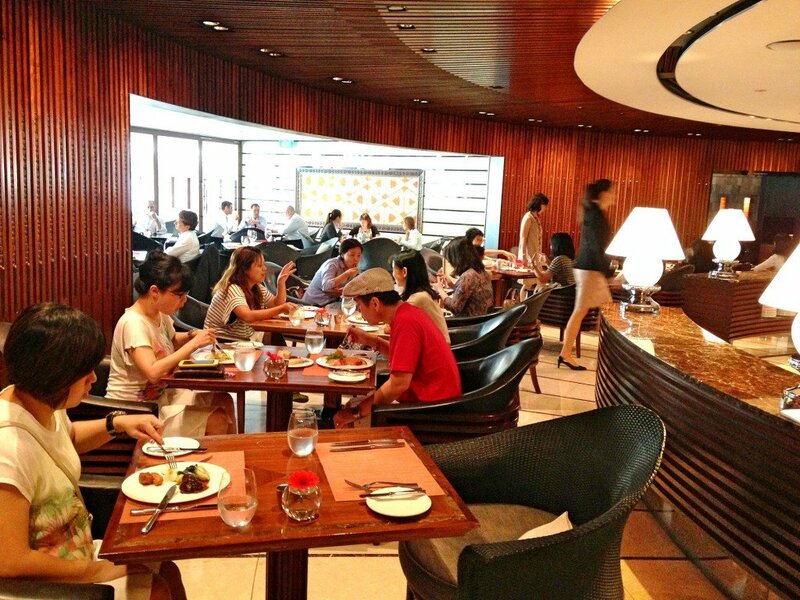 Repeat business will come after being satisfied by the food and service. Some contractors might quote a very cheap price, but that usually means they are using cheap materials to build, which are less durable and may need to be replaced or refurbished after a year, incurring more expenses. A rough gauge is to spend around $100 – $120 per square foot of area. So for a 1000 sqf restaurant, you should be spending around $100,000 – S$120,000 on renovations and furniture (excluding kitchen equipment). Other things to note is the planning of your kitchen layout in the most optimal, efficient manner. Get a professional kitchen planner if you are unsure, as this can increase productivity significantly. There are many mandatory license to apply for, and others depending on your concept- is it a cafe, restaurant or bar? Here are the common ones for Food & Beverage in Singapore with the appropriate hyperlinks that will lead you on the path of getting all the required licenses. Food Shop License to operate a food stall, apply only after you have signed the tenancy agreement and your interior layout plan has been finished. Basic Food Hygiene Course sign up to get certified for all food handlers. Liquor License if intending to sell liquors/beers. There are several classes. Importing Foods through the Food Control Division, Agri-Food & Veterinary Authority of Singapore (AVA). Halal License if serving halal customers. Registering for Central Provident Fund (CPF) as an Employer. CPF is a social security savings plan mandatory for all Singapore employers to contribute to as a percent of monthly salary, usually at 16%. *Optional* Registering for 7% Government Service Tax (GST). Mandatory only if your company annual turnover is over S$1 million. First, you need to settle the large ticket items like your combi-oven, salamander, stoves, freezers and chillers. 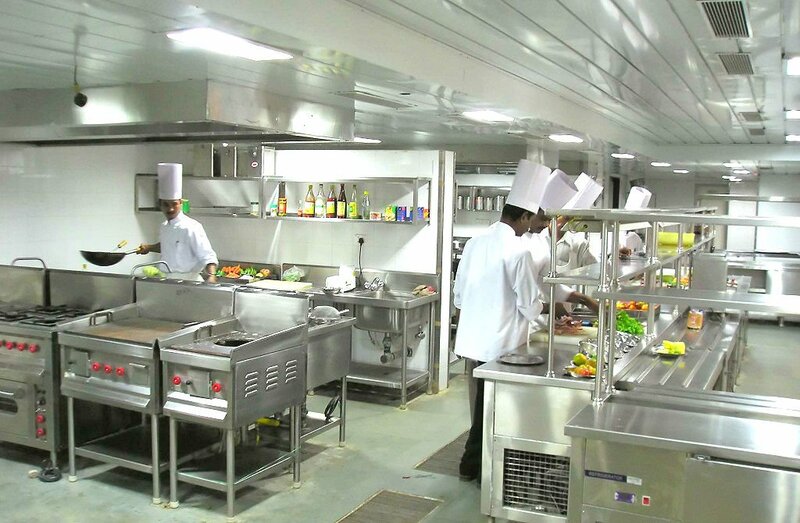 There are many companies that sell commercial kitchen products. Jackie’s or U-Save for example serve generic and common F&B equipment that you can consider. You will also need to get restaurant standard utensils, rather than just using the ubiquitous Ikea cutlery. At Temple street, Sia Huat and Lau Choy Seng are 2 of the favorite shops for restauranteurs and chefs. Catering to our local food industry specifically, state that you are in the F&B business and get a 20% discount. They might require some verification though, like your name card. This is probably one of the biggest headaches in the Singapore F&B scene now. With a tight noose on foreign talent quotas and low local demand for F&B jobs, hiring labour is a goliath task. First, you need to offer above industry rates to attract good talent. Link it to profit sharing if possible for managers. Make sure to screen and interview thoroughly, and it is always better to get amiable, naturally friendly personalities rather than train them to smile. Some people are born for the service line, others are thrown in because they have no other skill set. Choose the passionate ones carefully. Advertising in the local newspaper classifieds is one way to get interviews, but quite costly. Online job portals will also yield more foreign inquiries rather than locals, but still a feasible and cheaper option. The best method I’ve found to work is headhunting from other existing F&B establishments. Although questionable in ethics, this yields you the best results after you have personally seen them in action and the authentic service standards given. If you can offer a better work environment with better pay, why not? Many clients, as I’ve mentioned, don’t even have a basic plan to gain awareness. If customers do not know you exist, how will they buy from you? And after knowing your existence, what is it about your restaurant that compels them to give it a try? These are all questions that should be addressed and thought out way before you even open your F&B business or restaurant. If you have no experience setting up a F&B business or have never worked a restaurant floor, chances are that you are going to make loads of mistakes that will cost you tens of thousands. No experience cooking commercially? Get a chef consultant. Cooking for 40 people is very, very different from cooking for 4 people, and even if you are a home cook, scalablity comes with experience working in commercial, fast-paced kitchens. No idea how to market you food business after it launches? Get an F&B marketing specialist like myself. Good food is just one part of the equation, while good marketing is the other. It’s only logical to have a plan on how to get customers in first, before you throw in a hundred thousand? Yes, you might have to spend a couple thousand upfront, but successful business owners know to look at the long run benefits. Consultants can save you from wasting thousands on inexperienced purchases and decisions, as well as earn you tens of thousands more from the right business decisions. I’ve seen far too many restaurants start up for a year, then start to panic and spend money on all sorts of useless advertising. They also make many mistakes, like using Groupon, or signing up to some ‘street directory website package’. Plan it well right from the start, and get experienced help. 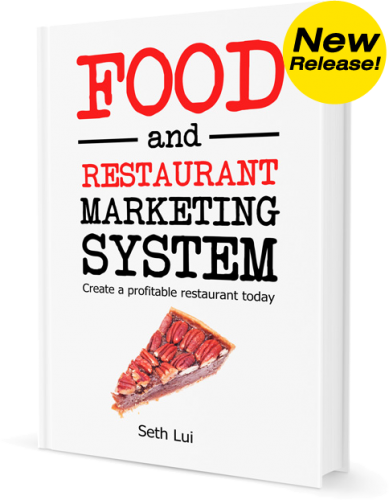 Need help on how to market your F&B business in Singapore? Read my ebook.